Thankfully, key control systems have put that old adage to rest by automatically recording and tracking all key access activity. Now, keys of all sizes and kinds are securely held in tamper-proof key cabinets that require user authentication to access. When a key is removed or returned by an authorized user, the system automatically records the information including user name, date and time. At any time, Managers can view the status of any key in the system; quickly locate any key in the system; determine who currently has which keys out and when they are scheduled to be returned; or determine who has had keys out. But it doesn’t stop there. 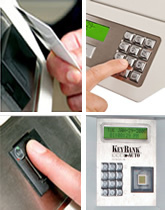 When the key control systems are integrated into the company network, the information and overall physical security is enhanced. For example, email and/or text alerts can be sent to management if a key is not returned as scheduled allowing immediate follow-up action. Or, systems featuring alarm and relay inputs/outputs can be integrated with existing video surveillance systems for additional security. Integration with the access control system also allows system administrators to regulate the area of movement within the building for staff with keys. An employee who has taken a specific key can be denied egress from the facility via an access-controlled door until the key is returned.